Others had mentioned their's arrived with a smell. Not mine! Beautiful and looks amazing! Casual elegance meets pure uncompromising comfort with this Premium Quilted Coverlet by Merit Linens Sure to compliment any bedroom style, this beautiful coverlet is available in three timeless patterns and six vintage, captivating colors. The Merit Linens Coverlet is spun from our Premium Microfiber yarns, offering twice the durability of cotton and is 100% hypoallergenic. Enjoy easy maintenance with this machine washable, wrinkle free and stain resistant premium beauty. Truly an All Season Coverlet, it will keep you warm in the winter and cool in the summer. Merit Linens Premium Quilted Coverlet will surely add the finishing touch to your tranquil bedroom oasis. This is a great coverlet if you want something simple and clean looking. It's warm without being overly hot. The ONLY issue I had with it was the smell when I received it. VERY musty. The first wash did not get it out. The second wash didn't get it out. I went against the instructions on the third wash and added bleach. This took away the smell. I dried it on an "air only" setting but also added a medium heat for 20 min at the end. Placed it on my bed and am very pleased with it! This coverlet itself is pretty nice - a little thin, but the fabric is quite soft and cottony-feeling. HOWEVER. It was delivered not sealed in plastic. The quilt and shams were rolled up tightly in a plastic bag inside the cloth cover bag, but the top of the plastic bag was open. And the whole thing stank VERY strongly of dank, musty, awfulness. So strong, the smell came off on my hands just from touching it. So I immediately washed it on warm (even though the directions say cold, I knew that wasn't going to cut it) with my usual unscented laundry detergent. Took it out of the washer, and the smell seemed to have disappeared, yay! So I threw it in the dryer on low, excited to use it. Then I took it out. The smell was much fainter, but still there. So I sighed and washed it again and dried it again. STILL THERE. It's now on wash number three and I added some white vinegar to the fabric softener section. We'll see what happens, but at this point it's ridiculous. I would not buy this product again, nor recommend it to anyone. At least, not until Overstock gives their warehouse a very thorough cleaning and starts sealing their bedding properly. 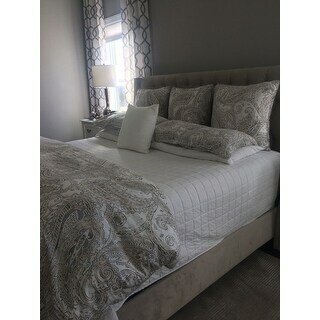 Merit Linens Premium Ultra Soft Square Pattern Quilted Coverlet Set This is a lovely simple white coverlet and the nice thing is it actually fits the bed. Sounds simple, and something I would expect when a spread is listed as a king size. King spreads all seem a bit short, covering the top of the bed, but seldom sides of the bed. This one does. The white color also is so crisp and clean looking. I have been looking for a twin size coverlet for a while now. Have looked several places but did not find what I wanted, until I looked on overstock. This company does not disappoint. I have learned to just come here right away. Bought his for a guest room and did not want to spend much. Bought this at a great price, great quality. Love it! So soft to the touch and beautiful colors! I purchased the blue and yellow to compliment a colorful quilt I was given. The quilt and pillow cases are packaged nicely in a cute fabric bag. I couldn’t be happier with this purchase and am contemplating getting another color! Exactly the simple light blue coverlet I wanted. Maybe I didn't read the whole description, but this set came in a cylindrical cover that can be used as a pillow in addition to the Shams! Really love this set! It is very soft and comfortable. Nicely oversized for our very tall king mattress. I have washed it several times and it has not shrunk. The color is very beautiful. This coverlet is actually large enough for my bed. Most that I have purchased before have no drop off the edge of the mattress. This one has a generous drop. My only concern was the chemical odor the coverlet had when I received it. I washed it twice with some white vinegar and it was remedied. Nice set, Overstock!! This was the perfect addition to my bedroom. I happen to be using it across the bottom of the bed, compliments my velvet coverlet beautifully. Thank you overstock! Super soft, I wish it didn’t have white stitching, but I really do like it. In love with this quilt.. so much so that I purchased 2, one for me and one for my sister. I ordered the king and it fits my bed perfectly. Hangs down almost to the ground which I love. Lightweight yet warm and cozy. My sister loves it to. Extremely soft! Also it was thicker than I expected based on the great price. Very happy! This is a nice set and light enough for the summer weather. I wanted a plain color because of the floral curtains I have and with a floral quilt it would have been too much. Too thin and seemed pretty cheap in material. I guess it would be worth it for the price but I changed my mind. Sooooo soft! It's summer weight, so with or without a blanket, this is a year round quilt! Very well made. The ecru color is so soft and would literally match anything! Perfect, was exactly what I was looking for. 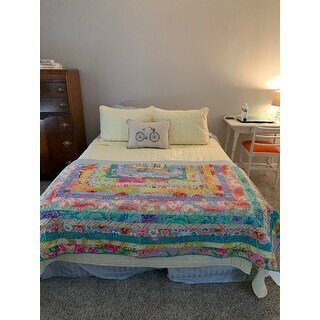 Lightweight quilt that can be used most of the time in climate I live in. Came right out of package and onto the bed, no smell. Looks nice on my bed. I like a thin bedspread, not to bulky. 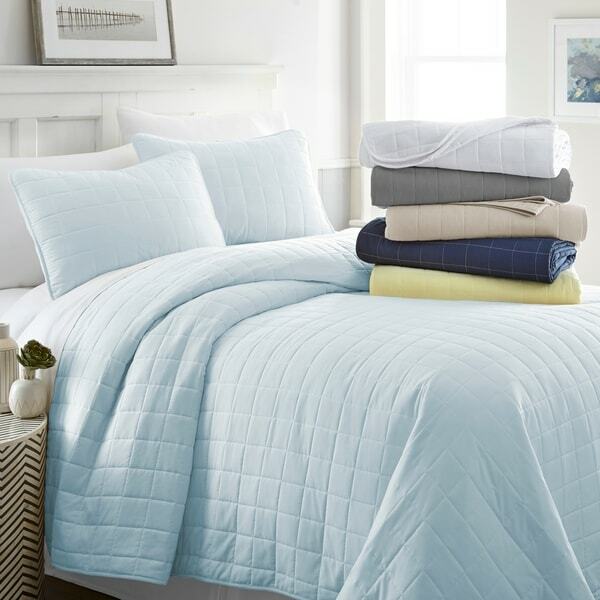 "The light blue quilt shows more like a pale blue/green spa color. I am looking for a true baby blue, no hint of green. Is there anyway to verify since the online picture are not very good." "What is the fabric content of the duvet?"